MAY 2014 GREETINGS FROM YOUR SCHOLASTIC CLAY TARGET PROGRAM: It has been a spring of MORE at the SCTP – more young people shooting, more teams, more events, more endowment fund opportunities, and frankly, more work! But that is a good thing, because we see our extra efforts resulting in more lives affected and more families realizing the positive benefits of the shooting sports. One trend we're happily seeing more of is news stories about the growth of clay target teams in high schools and colleges. We're gratified to think we've had some influence on that trend. As we move into summer, you can watch for even MORE exciting happenings at SCTP. We're adding field staff to work with you on more events, and other team members to provide state-of-the-art technology, keep you better informed, and manage our funding sources. Oh, and there's more. Read on to learn what you can expect from your SCTP over the coming weeks and months. 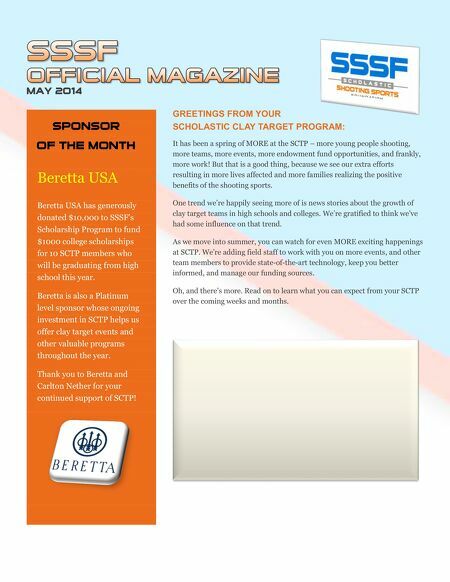 SPONSOR OF THE MONTH Beretta USA Beretta USA has generously donated $10,000 to SSSF's Scholarship Program to fund $1000 college scholarships for 10 SCTP members who will be graduating from high school this year. Beretta is also a Platinum level sponsor whose ongoing investment in SCTP helps us offer clay target events and other valuable programs throughout the year. Thank you to Beretta and Carlton Nether for your continued support of SCTP!